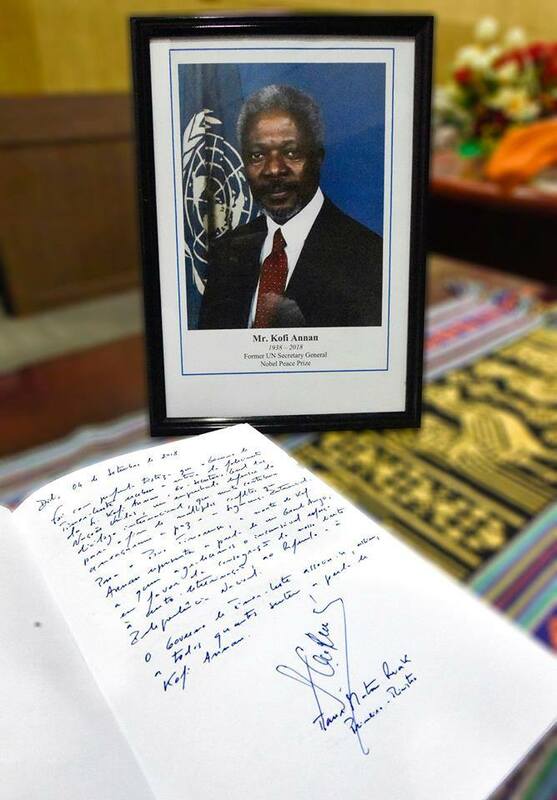 The members of the Eight Constitutional Government signed today, September 5, 2018, the book of condolences for the death of the former Secretary-General of the United Nations, Kofi Annan, who died on August 18. Kofi Annan led the United Nations from 1997 to 2006 and was awarded the Nobel Peace Prize in 2001. 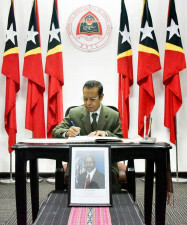 The 7th Secretary-General of the United Nations, during his tenure, spearheaded trilateral meetings between the UN, Indonesia and Portugal to resolve the Timor-Leste conflict, which led to the referendum that determined the independence of Timor-Leste. The National Parliament unanimously approved on the 23rd of August a Vote of Condolences for the death of Kofi Annan and on the 19th of August Prime-Minister Taur Matan Ruak offered condolences on behalf of the Government and the entire Timorese People, affirming that "his memory will forever be linked to the history of Timor-Leste as he has worked relentlessly for the international recognition of the right of self-determination of our People and, following the popular consultation that determined the independence of our Nation, launched the bases on which the construction of the present Timorese State is based ". The book with the messages of the members of the Government will be delivered to the head of the United Nations Development Program (UNDP) in Timor-Leste, Cláudio Providas, to be sent to the headquarters of the United Nations.